I was moving right along with my first One-Shot, also the first comic book I've done in a year, until something didn't feel right. I couldn't put a finger on it, so I gave myself a couple days to think about what I've done so far. One thing that popped into my head was I broke a personal rule of mine. Work with in my comfort zone. I'm naturally a doodler when it comes to drawing. I rarely draw faces who's heads measure over an inch in length ( not aspect size, the size I draw them at ). Feeling I was doing myself a disservice by trying to do something I wasn't comfortable with, I thought I solved my lingering concern. But it was only the tip of the iceberg. I also noticed the comic book in whole doesn't feel right. I got half of it done, and a part of me wants to finish it. But still I feel I missed something, so I went back to the books. As I mentioned before my favorite comics to read are GI Joe and X-Men. However when I draw, I prefer something that looks like a Manga. This is where I found the problem. My script and style were dictating my overall direction of my story. While I wanted to make something that read like and old school comic book, I was really making something completely different. Now at first I thought this was just me being lazy again and I'll have another failed project on the shelf. However the more I looked into it and analyzed what I was doing, I found I created a conflict between what I wanted to accomplish and what I was actually doing. This conflict eventually over came my progress and made me sit back and actually examine what the problem was. I couldn't figure it out right away, so I did what I usually do when I'm stuck. Just doodle and read some comic books. After a couple days I looked at what I was doing. When it came to doodling I was concentrating on Bust and Full shots. When I read some comic books I was looking at more Wide and Mid shots. This was the conflict I discovered with in myself. I wasn't concentrating on what actually made me read the comics I like. Instead I was relying completely off what I practice the most. Thinking I was on to something I decided to use Math ( Oh yeah, Math rules ) to give me a better picture of what I needed to do to keep myself interested in what I'm doing. To do that I broke down the different panels used in 2 comic books I regularly read to see what made them up. The results were surprising. 2 Comic Books for a total of 199 panels. The One-Shot I was working on told a different story. It's mostly made up of Close-Ups and Bust Shots. With a majority of those Bust Shots mistaken as Mid Shots and with very few Wide Shots. In the end I found my answer to why I stopped working on it, I had an image of what I wanted it to be, but was doing something that wasn't even close to being that. In other words, my sub-conscience shut it down. Now I was quick to figure I was just being lazy, but everything I've done the past year or so lead me to think this wasn't the case. To explain that I'll take you back to 2 years ago where I decided to take my fandom and hobby to the next level. At first I was all gun-ho about making a comic book. But I ran into a lot of problems off the bat. My depression which lead to me not drawing for nearly 3 years had a strong effect. I couldn't draw men, I forgot how to draw in perspective correctly, and all the other little things took a dive as well. Proportions, hands, faces, anatomy, the list went on. So before I could draw anything I basically had to teach myself to draw all over again. I also took this opportunity to draw digitally as well. After nearly 2 years of doodling, sketching, reading, and studying I finally became satisfied with what I was doing. However I also felt I wasted time. All those activities created a lot of clutter, clutter I saw that could have been used to make a comic book. All that lead me to the One-Shot process I've put in this blog. So laziness wasn't an issue. I've had countless days over the last 2 years of doing nothing but drawing for 6-8 hours straight. I would wake up in the morning and just draw as soon as I got my morning coffee. So when I had this urge to stop drawing my One-Shot last week, I knew it had to be something besides being a procrastinator. Something was trying to communicate with me, and by looking what i was doing, how I was doing it, and what I wanted to achieve made me figure out what it is. For now I shelved my One-Shot, however I can pick it back up if I want to in the future. It might seem like wasted time, but I ended up learning something about myself in that process. If I had just stopped and tried to do another one thinking I was just bored with it and that was that, I wouldn't have come to the conclusion that I was making something I didn't want to make. Somewhere in between all this lies the connection between the doodler in me and the comic book artist in me. 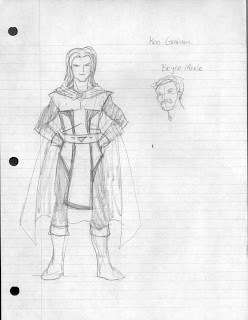 I need to find that connection so I can exploit it to the point where every time I draw, I'm working on a comic book. Because the doodler me can draw and draw 24/7. So how do I get there? Do I just practice Mid and Wide Shots? Do I change my subject matter? Or is there something else I can do to make the connection easier? For starters I need to ask myself these questions and remember some tips before I embark on anything in the future. Is this the kind of story I want to tell? If so, is it being told the best way possible? That might seem vague, but in reality I need a good story. One that leaves me satisfied so I can keep drawing. My One-Shot was a story I wanted to tell. However one reason I stopped was because in the back of my mind, I know it could have been told better. In simpler terms, I'm a hard guy to please even when I'm the one making something. If I don't want to draw something, don't draw it. Against my better judgement, I went ahead and added capes to all my Heroes in the One-Shot. I hate capes. Why would I add capes? Exactly. 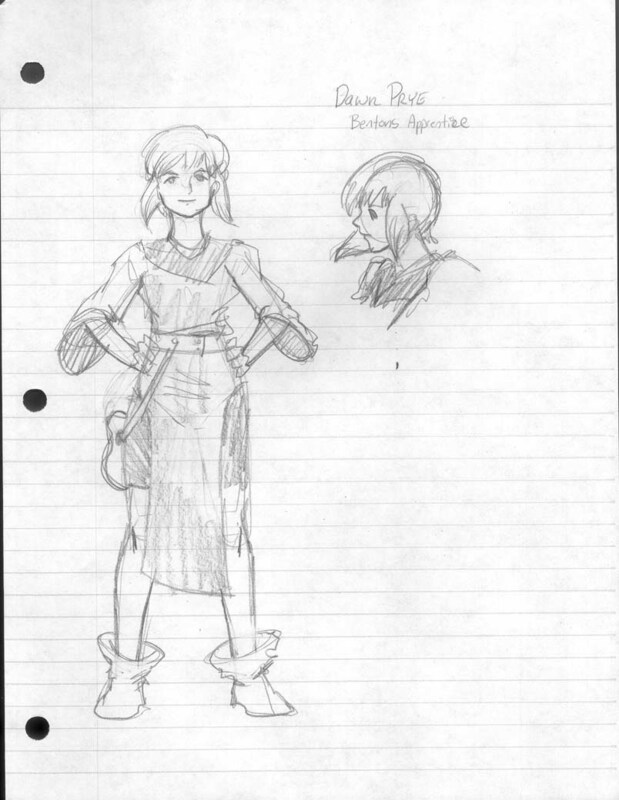 It's not that they're hard to draw, but to me they add unnecessary clutter to a character's design. I had visions of cool poses with them, but that didn't translate too well when it came to the characters interacting in their every day life. For some reason I kept them all stiff and generic for way too many panels. I should have listen to myself, but I didn't. Which is weird since I had the same conversation with myself in the past and opted for no capes. Maybe I wanted a challenge, but for making a One-Shot, I need to keep the challenges to minimum. I need to draw what I'm comfortable drawing. I don't have to draw everything, use dialog to help with the action. Switch between subjects when necessary. This is something I didn't catch till about 5 hours ago. I had a whole page that was nothing more than 2 characters getting from where they were to where I wanted them. Actually it was a page an half. In my head I thought " I don't want to draw all these backgrounds". But in reality I was adding an action sequence that was useless. 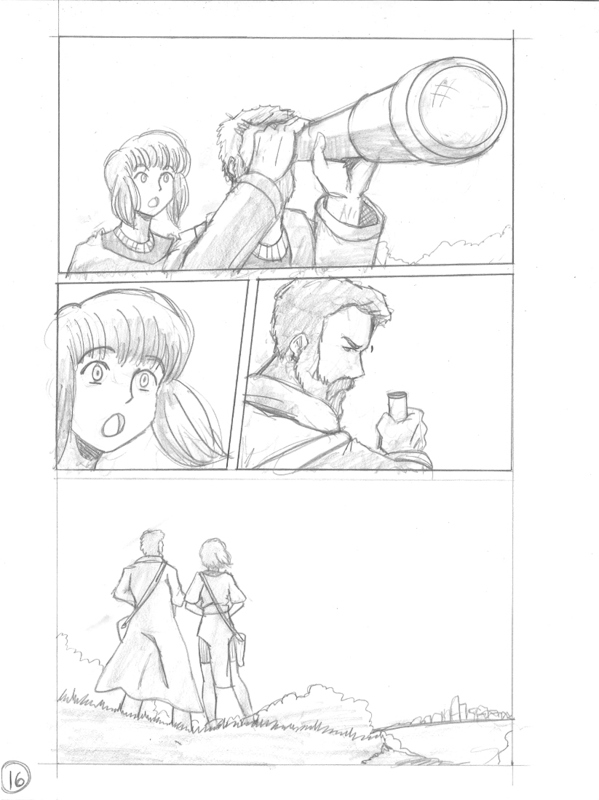 I could have had the characters say " We'll make it over there" then cut back to something else only to show the characters where the needed to be later.In other words I wasted panels, time, and bored myself with a useless action. I should have known better. Draw with in my comfort zone. Remember I said I draw small. This is probably a handicap and definitely not an industry standard. But it is how I draw. Anytime I draw subjects bigger than I'm use too, things look weird. Including the pages I uploaded. Now I have 2 options on how to remedy this. I can still make my pages 1/2 larger than the finished sized, but keep my subjects with in my comfort zone and add more panels. Or I could make my pages smaller, even at 1:1 size. Now the second option has limitations. Even I can't draw that small, but to compensate I can do that on a story that has less than 5 panels per page ( I made a mini comic where each page was so small, I could only do 3 pages max ) I could have, and should have done this One-Shot like that, since all my perspective work was going to be done on the computer anyways. But for something that will use more than 5 panels per page, it would have to larger so I could have some various sizes on my subjects with in each panel. This was something I decided when I was doodling, that the amount of panels per page will dictate the size I can make my comic book at. It will however, only work for me. It's part of that self discovery thing I was taking about.This is just one example of how all artists should review the things they do and how they do them. You might find something about yourself you didn't know. I don't know what I'll do next. But after studying my work the past few days I've learned more about myself than I would have if I had done nothing at all. 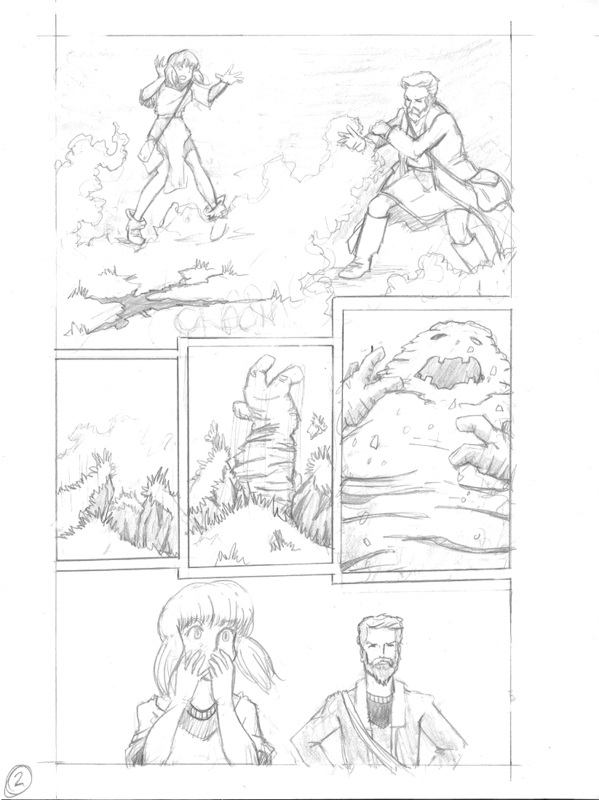 I still think the process I laid out for making One-Shots is a perfect example of how to balance writing and drawing to create a sequential piece of art. But as for me I have a split personality. 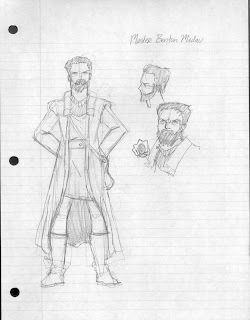 The doodler artist and comic book artist with in me are struggling to find a common ground. One one side I have the doodler who can draw for hours on end, wishing everything he drew told a story so he could share it with other people. On the other side is the comic book artist who has a story to tell, but can't draw for hours on end because something is holding him back. It really is a conundrum and something I need to address. But I do know this. I have the passion. I have ideas. And I know if I apply myself a little harder I can find that common ground. I can make that connection. I guess I just never asked myself the one question I've always avoided. Oh so badly. Now to do something about it. I wanted to work on this with the computer, but the eye strain was too much for me to take. So I decided Sunday to do the pencils by hand, leaving the rest to be done on the computer once my eyes take break. 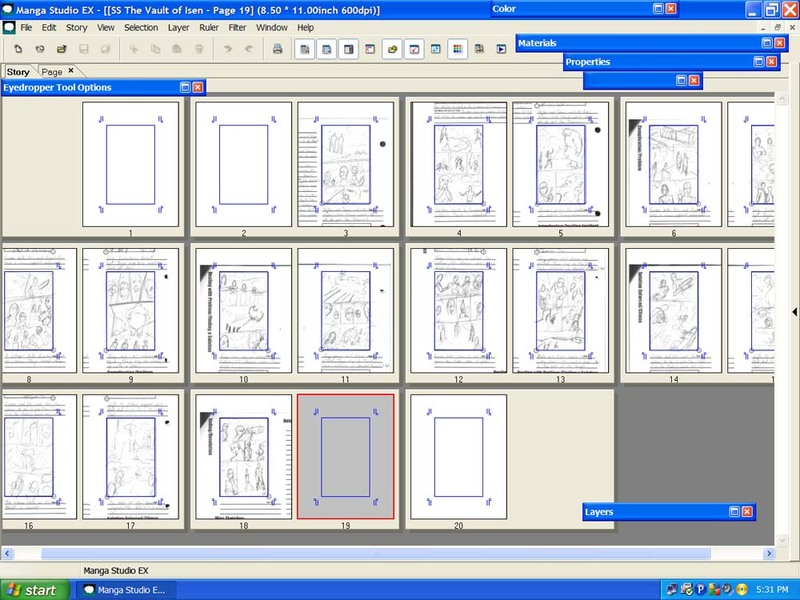 With that I began prepping my pages so they'd be in the same aspect ratio to the reduced size. As a personal rule I work 30% larger than the finished size. So 30% larger than 4.5 x 6.94 will be just enough for me to work on a standard 8.5 x 11 piece of paper. I used Blue Line Pro paper that I purchased years ago and have been meaning to use it up. So I cut it all in half and used the back side of that paper for my pencils. Personally I'm not too picky about what kind of paper I use to pencil it all out. I was even going to use loose leaf paper just because I have a ton of it sitting around. But I figure since I had a ton of paper sitting around that I paid good money for back when I had money I'd use it up. In my honest opinion though, if you plan to pencil by hand and scan in your art to do the inking, coloring, and lettering, you can use any kind of paper as long as the aspect ratio of your finished size adds up. A sketchbook will do as well, especially if you're like me and plan to do all your perspective work on the computer. So here are my 4 pages done so far. I decided to follow my plan of doing the Introduction and Ending first, since these were the only areas my two Antagonists appear in. I did this to keep some consistency for them when I was drawing it out. But even after two days there were slit differences in each panel. However their main features are pretty consistent. My main focus was mostly the characters. I already know in my head that effects, SFX, the town in the background, and any other background imagery will be completed using Manga Studio when I ink it. Even at this stage I'm still a little concern of the guys arms in the first and last page. I'll at least be able to use these pencils as a reference I can use later in Manga Studio to make sure it's up to my standards. I was also a little upset that the paper I used was too thick. Even held up to the light, I could barely make out any flaws when I flipped the page. This is a good technique to use to find errors you may not see looking at it normally. To get any idea I had to use a lot of hard lines even on the sketching phase of it. I didn't like this so by the time I got to page 3 I opted to get an idea, and use Manga Studio to find any flaws. Next time I'll probably use lighter paper. I don't like doing too much erasing and normally draw really light and then go back over each page with a hard pencil stroke. It's common for me to see all the under sketching in my work when I scan it in. As far as the dialog, I don't add it in now since my handwriting is pretty bad to follow digitally. I just made sure I left enough room for my word balloons. However when I ink these, I'll do the lettering first. 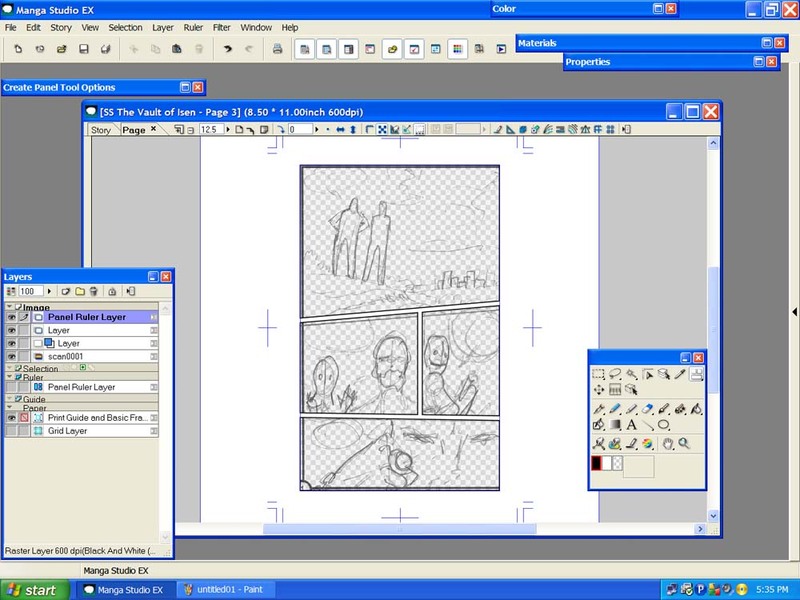 That way id I need room I can cutout the content of a panel and resize it in case I didn't leave enough room. Though it's safe to say this comic will come out without that doing that since it isn't dialog heavy. However that doesn't mean I can't move around each panel as I so desire. It will be up to me as I progress in the later stages. But for now the ground work is 1/4 done. Now to do the other 12 pages. Now that I have all my thumbnails completed it's time to get started with the rest of the work. 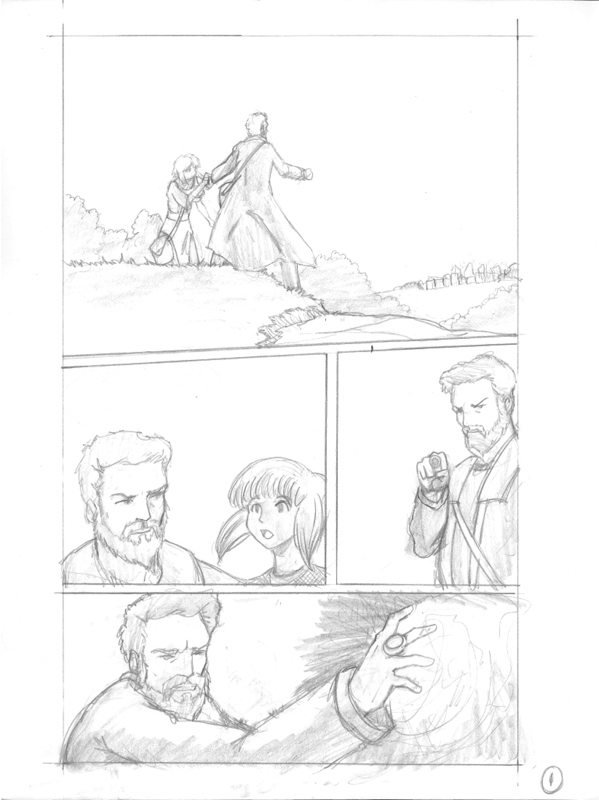 My first job will be to import my thumbnails into a story using Manga Studio. The methods I use can also be emulated in other programs, but Manga Studio's soul purpose is comics. And it's full of handy tools to keep myself organized as I work. 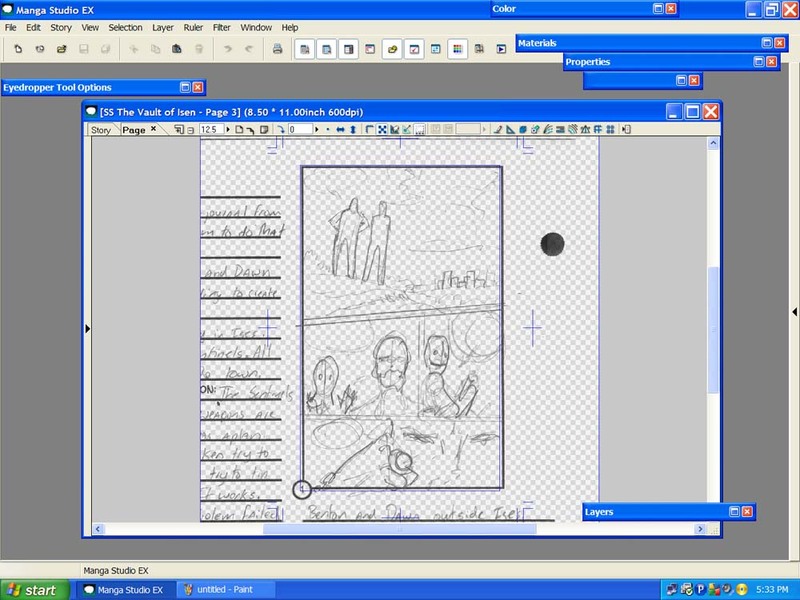 I'll start by creating a new story using a page layout I created with specific specs. My thumbnails will fit with in those specs, that once finished will be the same specs Tokyo Pop uses for OELs. I haven't bothered to see if they updated their specs or not, since I don't plan on sending them anything. But it's the specs I've gotten use to using over the years, so to be consistent with what I'll do, I'll stick to them for now. In Manga Studio I opened a new story with 20 pages ( the reason 20 is because I want those black areas to fill in later for a Cover, Back Cover, and inside flaps in case I want to print out a finished copy later that reads like a real comic book ) With a complete layout of all the pages, I then go one by one and place the thumbnails in the proper order. Manga Studio saves both the Story and Pages as separate files. Since my computer is really old and slow, working with this many pages open at once, and at 600 dpi really pushed it. It will only get worse when I add my pencils, inks, and everything else. After they are placed in the proper order I save it all and close. Now I can go back and open each page on it own and work from there. Zoomed in you can see how my thumbnail almost fills up my safety area. It's close enough for what I'll use it for. I also have my pages numbered on the thumbnail so I didn't lose track while importing them. 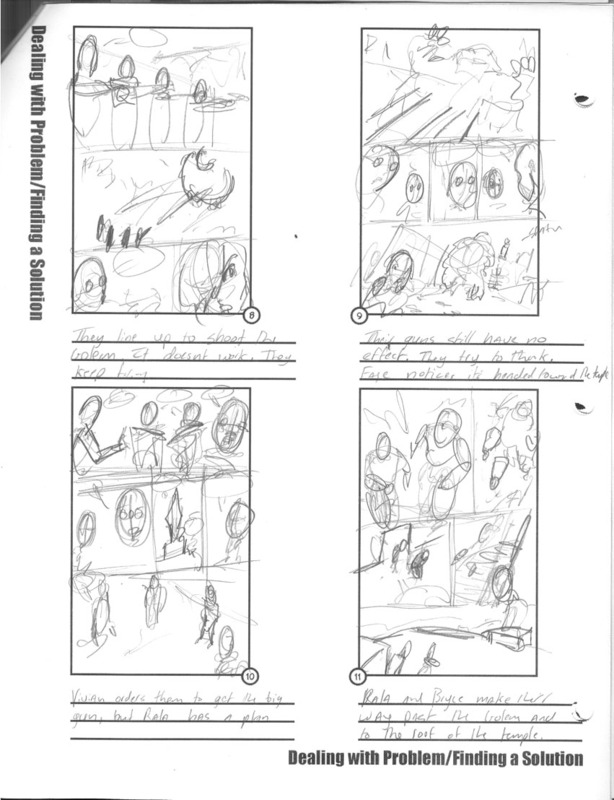 Now that I'm working on one file at a time I can begin penciling over my thumbnails. I'll drop the Opacity of the thumbnail and use the sketch layer to start building up my panels. But before I do that I'll make my panel layer. Using the panel ruler layer I create my panels. Once finished I Rasterize it and place it over all the other layers. This is a technique you can do in Photoshop as well. Notice how the area of my panels is transparent and the rest is opaque with white. This can easily be done in Photoshop with a separate layer and using either the blending options ( recommended for tinkering ) or the line tool. 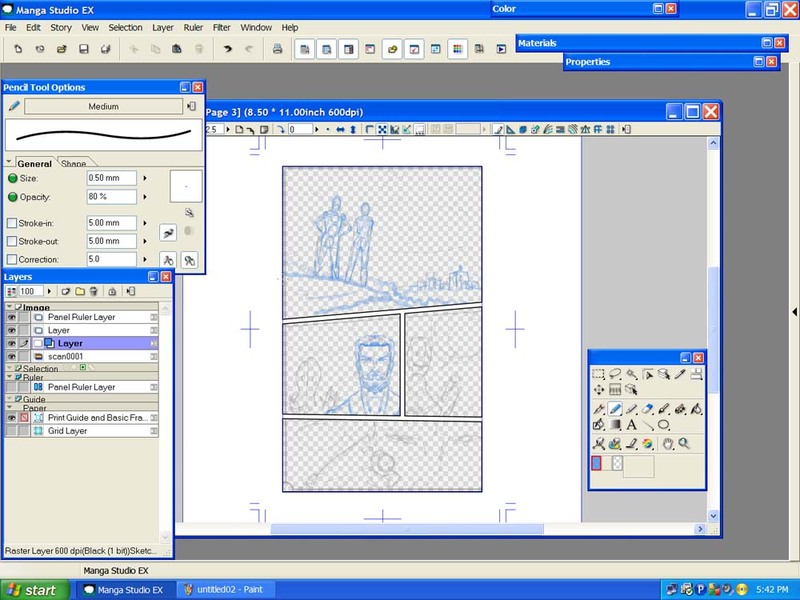 Manga Studio also uses Panel Folders. Now I use to think these were great because it made a folder for every single panel, with all it's contents staying with in it. But it created too much clutter for me. Also when I zoom in and out like I do most of the time, it always went to the center of the panel, not to the area I wanted to zoom in on. Some people like them, but I prefer to use as few layers as possible, because it's going to get crazy once I start adding the dialog. With my panels already determined ( I saved the Ruler Layer in case I want to make changes later ) I'm ready to get into the process of fleshing out my thumbnails. 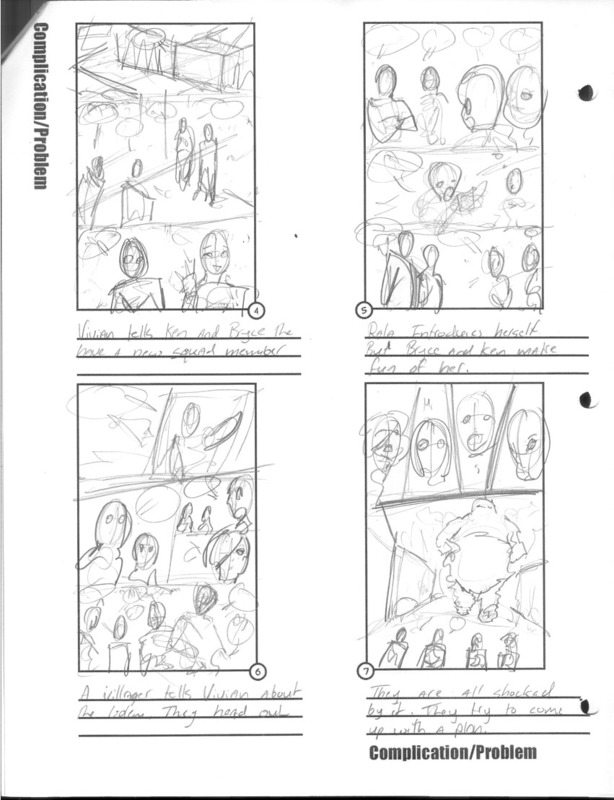 As I progress, the original thumbnails will disappear and my digital pencils will take over. I just roughed this out for now to illustrate the concept of how I'm working on this. I use a variety of pencils presets that I customized to have different opacities so I can build off my basic figures with a light pencil and as I progress move on to darker ones for the detail. The key to doing this digitally is to not rush it. Use the same methods as you would on paper and take your time. The two panels I did need to be gone over again, but at least I'm getting an idea of what I want, adding and erasing as I got along. Since I don't plan on using anymore than 2 pens when I ink ( That's what I'd use if I did this traditionally ) I plan to take my time on the pencils to make sure everything is the way I want it. And since this is done in Manga Studio once my pencils are finished, I can Ink and Letter this page before moving on to the next if I so desire. Manga Studio was made for this kind of work because it's loaded with all sorts of handy tools. Such as perspective rulers and symmetry rulers. You can also quickly flip and rotate your canvas just like I heard you can in the new edition of Photoshop. For now I just wanted to give a taste of how I go about tackling a comic book page in Manga Studio. The next entry I make will be with it finished. But don't worry, I'll make sure to break that down as well to show you how I got there. This is probably the hardest step in making a One-Shot. Actually coming up with something. Since my last post I spent 2 days thinking about what I wanted to do. I had no idea at the time what that might be. 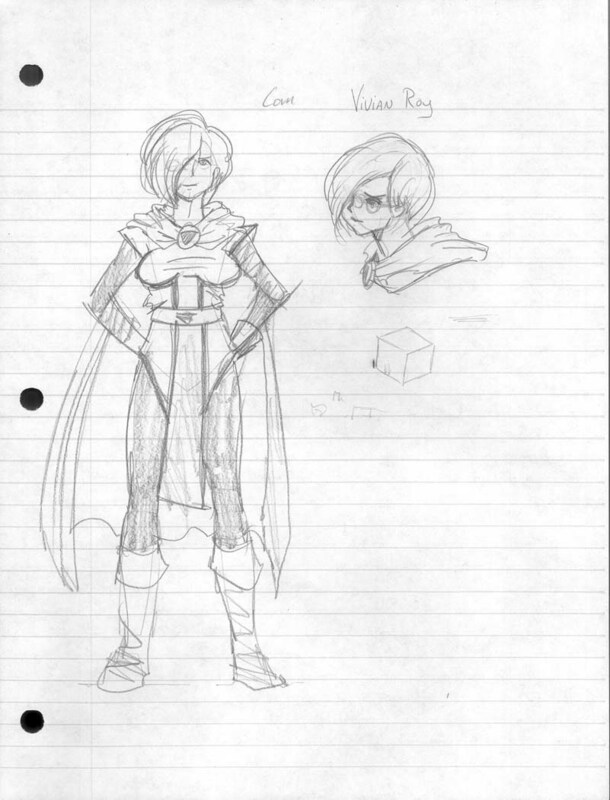 I was leaning towards a modern setting, but decided to bite the bullet and do my fantasy idea I've had sitting for well over a year. Coincidently this was the same idea I failed on last year, but instead of rehashing old story ideas I decided to start from scratch and just use the characters I had on hand. Although coming up with a plot wasn't easy. Since I wanted this to be an action orientated One-Shot I needed some concepts that went beyond Good vs Bad. Using this website, Chaotic Shiney, I saw an idea I haven't thought of and used it. The generator their provided this, " A Geomancer uses a Golem to ravish a town." From that simple plot idea, I was able to use my characters and make a short story out of it. How did I know this plot would be good? It wasn't the first one that popped up, but it was the first one that sparked something inside of me where I was able to see a whole story evolve from it. Before I even wrote anything down I already had an idea of how many characters I needed, where it will take place, and how it will Climax and End. The Climax and End were important because if I couldn't visualize those two things quickly, then my story would have been doomed from the very start. Once I was confident this will work for me. I began to write it out in my notebook. When I said notebook I wasn't kidding. I meant the good old fashion spiral variety. With my simple plot selected I fleshed it out here. I also gave my characters names, listing the ones I'd use, as well as giving myself a schedule on how long I had to get everything done. 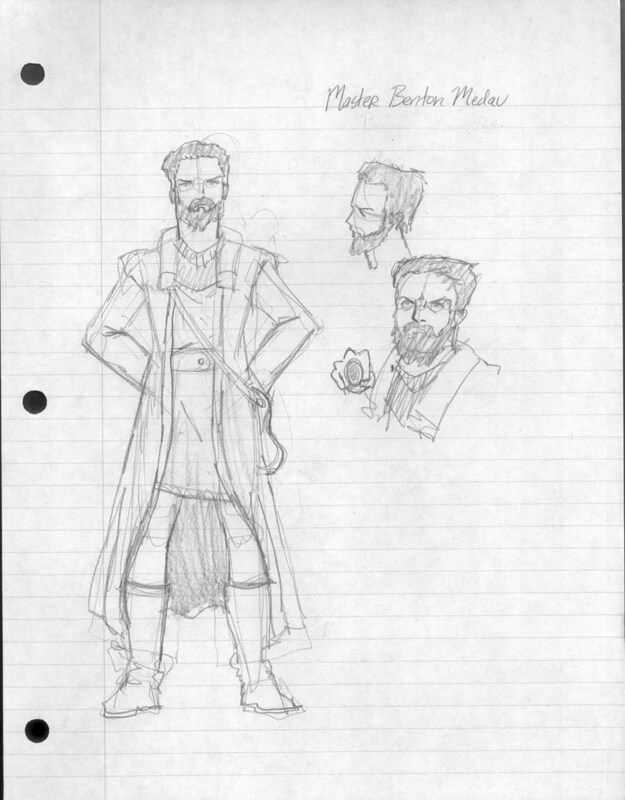 Once I felt this was good enough for my One-Shot I proceeded to make my character sketches. To make these I used a home-made stencil I crafted from a blank stencil you can purchase at any craft store. The stencil was built off an ordinary pose that I drew, then cut out in certain sections so I could quickly put a body on the paper and add in the face and costumes on top of it. I highly recommend blank stencils to any artist out there who knows they are going to use a repeated process over and over again. These can be used for any type of project you can think of. 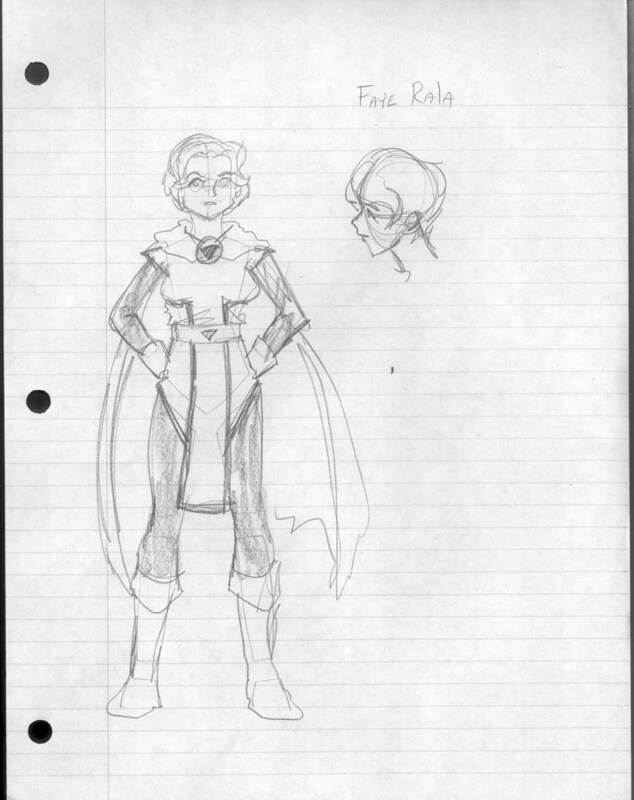 Word Balloons, Page Templates, and even your own handwriting. 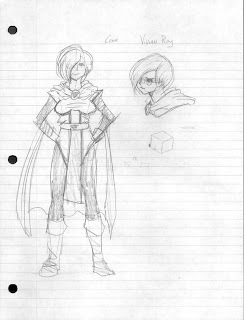 The character designs I decided to go with were my 3rd designs. Even though this is a fantasy with guns, I wanted it to seem somewhat more fantasy like and went with a tunic/cape design on my heroes as opposed to a full body suit/pants design I came up with first. I didn't want it to seem too fantasy like, hence the guns, but I didn't want to give the impression this was too modern. I had to balance it out. 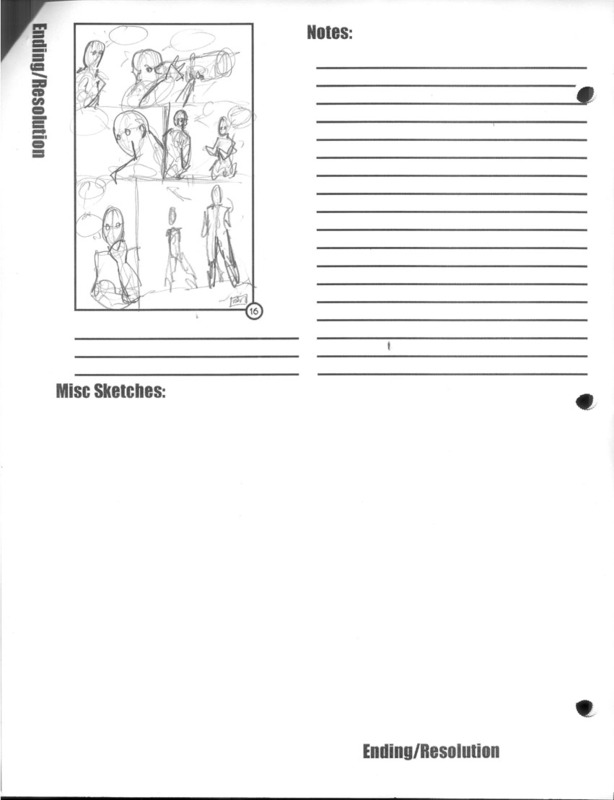 With my characters in place I began to do the thumbnail using the Thumbnail Worksheet I made in my previous entry. My thumbnails might be crude, but as long as I know what's happening in each panel I'm okay. If I was making this story for another artist, I would go back on these to flesh them out more. I tried to keep the figures simple, in some cases just an outline of them with an indication of how their head is orientated by adding circles for eyes or ears. Another thing to note is before I began. I laid out my Story Structure on Page 1. That was my guide to how the story would play out. Also each page represents each section of the Story Structure. By keeping it separated like that I was able to concentrate on one scene at a time. Also I was able to work backwards. After I finished my Introduction, I immediately did my Ending. 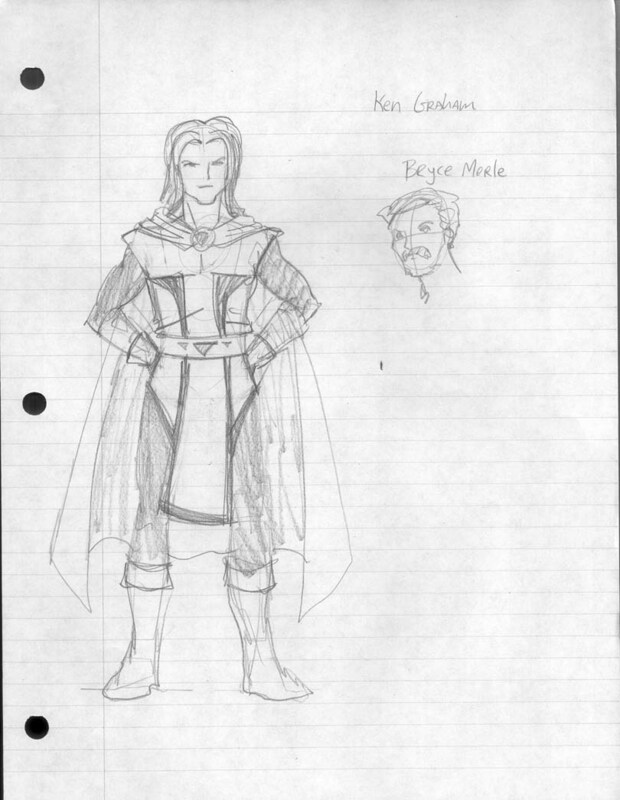 Since the Antagonist's are only on those sections of my One-Shot, when I draw this out I can do my Introduction and Ending first to stay consistent in my artwork when doing the Antagonists. 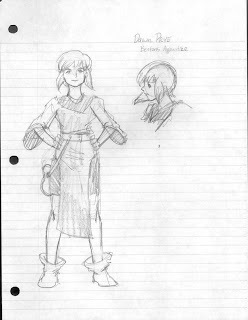 If I went in order, I'd have 12 pages of doing the Protagonists and the Golem, then have to go and draw the Antagonists from the beginning for just one page. The idea here is to be consistent. If I did a comic book that went back in forth between two groups, I'd work on one group first, then the other to stay consistent, even if it's done out of order. Another thing I did is when it came down to The Problem, Dealing With Problem, and The Climax I worked backwards again ( as mentioned in my tutorial ). Because I know how the scenes began and ended I worked around the whole Pagination Areas so I properly paneled my scenes. Take The Problem section for instance. 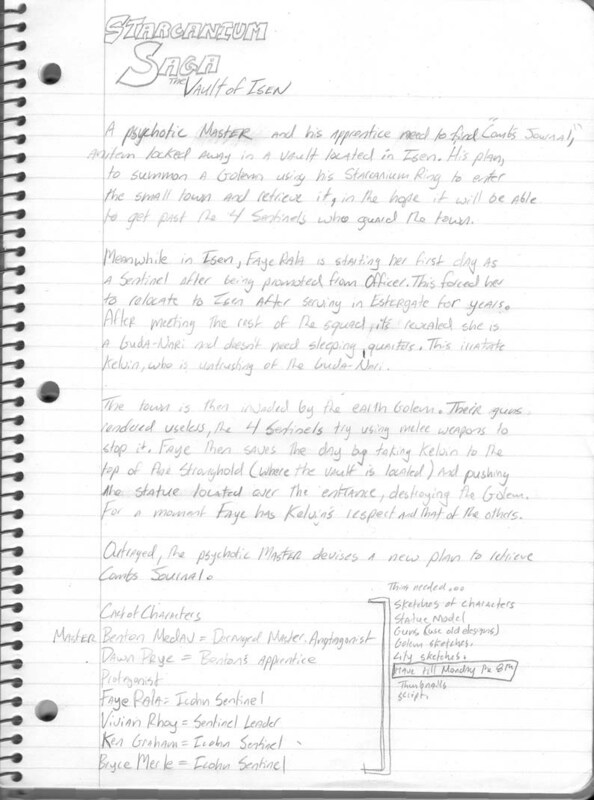 I know I had to use pages 4 and 5 to introduce my Protagonists since my Antagonists were in the Introduction. Before I started I knew I wanted the page 7 to end with the Golem marching down the street. That was the first thing I drew, then for my Page Breaker for page 7 I added each character in a surprised reaction to what they're seeing. After that I proceeded to do the other 3 pages. I started on Page 4 with a wide shoot of the town. 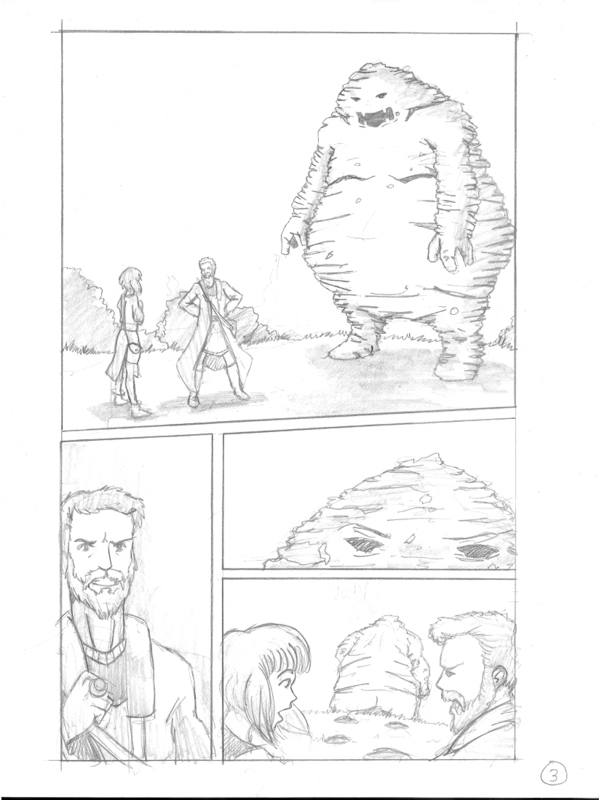 Then I knew a conversation would take place, so to end the conversation I had Page 6 start with a villager breaking up the conversation and warning our heroes of the Golem. With those main panels in place I started filling out the rest. I didn't keep what I first chose ( and if you look hard you can see eraser marks ) but by laying down key panels first, how it ends, where it starts, and where it changes, I was able to easily fill out the rest of the pages. This is what I mean in my tutorial about working around your scenes and Pagination Areas to determine your paneling. Onto the action in the Dealing with Problem and Climax sections. Guns are user friendly when it comes to action. You can use one panel ( wide or whatever ) and the amount of action you want out of the guns depends on how many SFX's you use. Cheap I know, but know this. Hand to hand to combat and any other form of physical actions require a lot of panels. I got off easy because my fantasy story does have guns ( a creative decision made last year ) but I had plans to add some melee weapons in here. That proved to be too much on my page count, so I scrapped it. However when 2 of my characters go to push the statue off the temple to crush the Golem, that was done in 2 sequences. Them running past the Golem and up the Temple to get to the roof, and then them pushing the Statue over. I also juggled that with the other 2 heroes who went to get bigger guns to slow down the Golem in the right spot so the statue would fall on him. This helped me balance out those 2 separate events happening in the same scene when it came to paneling my pages. I also started out by doing the last page of the Climax first. Knowing my Ending won't end with our heroes, I needed a moment at the end of the Climax for the Protagonists to celebrate a little. The aftermath being a Page Breaker panel that I will spend more time on than the others. With everything I need to finish my One-Shot completed I have several options. If I was busy ( which I'm not ) I could pack everything together and start another One-Shot project, leaving this one sit until I had the time to complete it. Or I could begin drawing it out. In this case I'll be drawing it out for the sake of the this blog. Doing that I have 2 routes I could go. I could do this traditionally or digitally. I will do this one in particular digitally with Manga Studio 4. With that option I'm going to take the scans of my thumbnails and place them on each page as a guide to draw out my One-Shot. I could do it traditionally, but for some of the panels I have designed I'll probably rely on the 3D model figures Manga Studio provides. Again the decision is all mine, and any way I decide on how to do this will work, it's just a matter of what I think will work best. To help me finish this quickly I'm going to keep this in the back of my mind. If I did the maximum panels I was allowed for these 16 pages, that's a possible 128 panels. At 15 minutes a panel that 32 hours. My On-Shot has a total of 67 panels, I think ( I'm not recounting ). That's half of the maximum I will allow myself to do for an average of 4 panels per page. If my math is right that should take 16 hours, give or take, to pencil this out. Add another 16 hours for inking, dialog, and colors/tones and I should have this done in a week. The only thing that could hold me back is if I get too creative in the art ( work outside my comfort zone ) or if I have eye and hand sprains. ( I'm known to sprain my hand a lot and I use a CRT monitor that just kills my eyes ) Either way if I treat this like a job, I should have no problem finishing this up if I work on it 6 hours a day. Just below full-time at a real job. 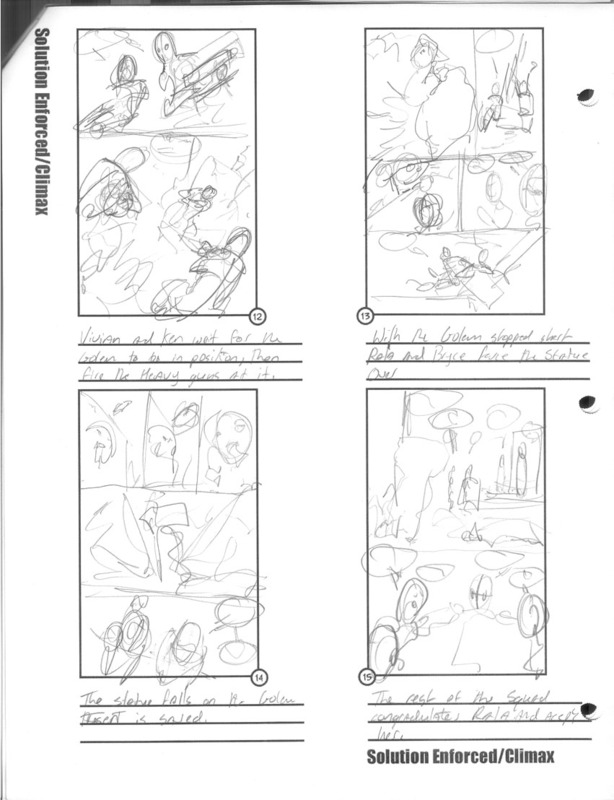 The Story, Characters, and Thumbnails are the hardest part of any One-Shot. With that out of the way I can concentrate on just drawing it up with no distractions or second guessing where my One-Shot is going. I already know how it will play out, now it's up to me to finish it up so people can read it.